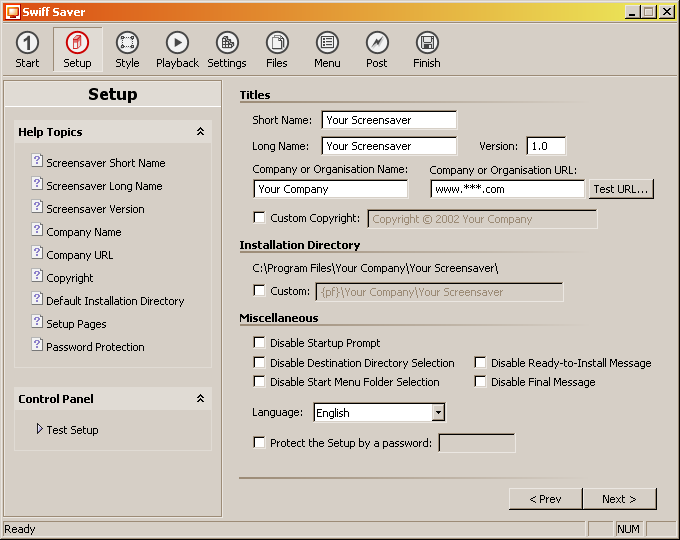 Swiff Saver lets you create Adobe Flash™ Screensavers packaged into professional Windows Installers. Simply import your Flash animation into Swiff Saver, follow the various steps to customize your own Installer and instantly generate the Setup program that will install and uninstall your own Flash screensaver. Swiff Saver generates real standard Windows Installers. Take a look at the following Setup Steps screenshots all generated by Swiff Saver! Swiff Saver comes with an extremely easy-to-use User Interface, for maximum efficiency. Complete Flash 4 or higher Support. Easy-to-use and Fast Wizard Interface. Supports Windows Vista, XP, 2000, NT4, ME, 98, 95. 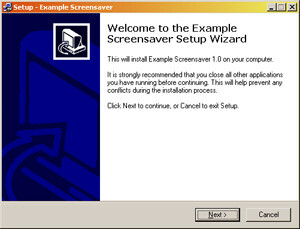 Note: Screensavers created with Swiff Saver don't embed the Adobe Flash Player. According to the Adobe Flash Penetration Survey, more than 98% of Web users can experience Adobe Flash content without having to download and install a player. Created screensavers will then be even smaller to distribute. Support of 10 different languages. Automatically create an Uninstaller program to remove the Screensaver from the system. Launch the "Display Properties" Dialog box after installation. Set the screensaver as default after installation. Generate the complete Windows Installer or only the .SCR file. Control the Windows Start Menu Entries. Add your own Start Menu Entries. Include/Install your own License File. Windows Vista, XP, 2000, NT4, ME, 98, 95. Full screen and Streched Full screen movie playback. Configure Screensaver Wake up. Control Mouse and Keyboard interactions. Customize your About Dialog Box: display your message, your image, your interactive movie with URLs, etc. Customize the standard Windows Display Properties Dialog Box. Setup your own Picture, Flash movie or Solid Color in the Screen panel. Instant Settings Dialog Box Preview. Instant Windows "Display Properties" Dialog Box Preview. Display Readme file after installation. Open the Windows Display Properties Standard Dialog Box after installation. Launch Specific File including EXE, HTML page, URL link, etc. Force Actions or Ask User with Custom Message before Actions.